This statement by the local newspaper back in 1863 sums up the feeling of Northern residents regarding the antics of Brig. Gen. John Hunt Morgan, who led his raiders on a chase through Ohio during the Civil War. His main goals were to destroy supply lines while creating chaos and fear. This special celebration took place in Lore City, Ohio at the Leatherwood Park trailhead of The Great Guernsey Trail, which is a paved pathway from Lore City to Cambridge used for walking and biking. Often you see parents pushing their children in strollers, or children pushing their parents in wheelchairs. This six mile trail has become a favorite spot to exercise and get some fresh air in the Guernsey County area. Local Civil War Roundtable members, Andy Warhola and Tom Snyder, explained Morgan’s ravaging two week raid through Ohio with slides, maps and pictures. They told of Morgan’s stealing two steamboats in order to cross the Ohio River into Indiana. Proceeding into Ohio above Cincinnati, they headed across the state with Union forces in pursuit. Thinking the best way to escape was to again cross the Ohio River, Morgan led his men to a ford, which would let them have easy access to Buffington Island, a stepping stone across the Ohio. But his plan went amiss when Morgan decided to wait until morning for the crossing instead of attempting to move in the pitch darkness of night. The next morning however produced heavy fog, so again he was delayed, thus giving the USS Moose time to reach their crossing point. This is said to be the only Civil War battle in Ohio. Here the Union turned Morgan and his Confederates away with heavy losses. What had started out as 2500 men, was down to approximatley 1100 after the battle at Buffington Island. After this they headed towards Guernsey County entering at Cumberland and continuing to Londonderry. Finally they were captured in Salineville, heading to the Ohio River again. Along the way they were hungry and needed horses so there was plenty of thievery and destruction. In the town of Campbell’s Station, which is today Lore City, there was more financial damage than anywhere else in the county. They robbed the safe in the warehouse of $4,000, then burned the warehouse, train station and bridge as well as three railroad cars filled with tobacco…all this before the Union forces arrived. Nearly 150 years later, Lore City was filled with a Civil War feeling as many dressed in clothing of the time. 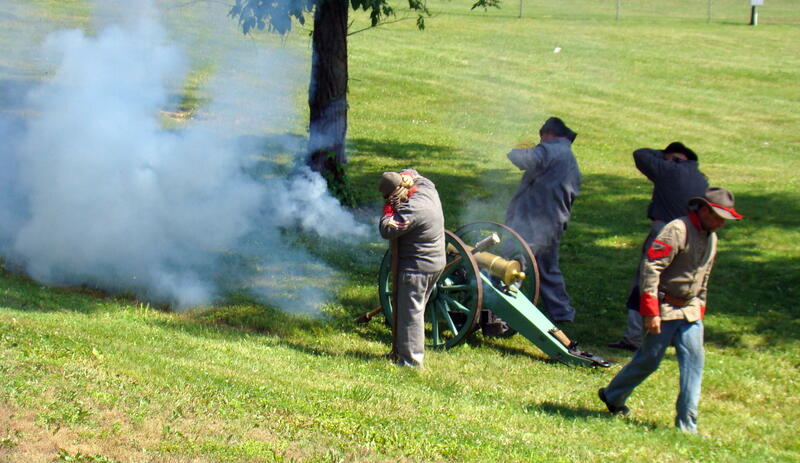 A cannon was fired several times after careful loading by a group of Morgan County Re-enactors dressed as Confederate soldiers. 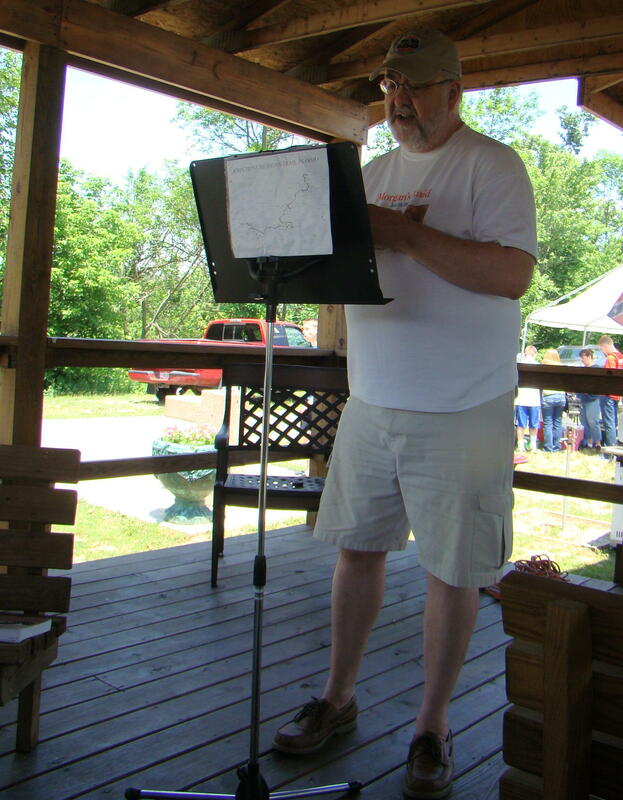 Local historian, Dave Adair, described the town of Campbell’s Station, which at the time of attack had only about sixty people. Their telegraph office was kept busy sending messages and receiving replies regarding Morgan’s Raiders. Due to the messages, Morgan and his Rebel scoundrels changed their route to avoid a railroad trestle, where a hundred men were waiting to ambush them. 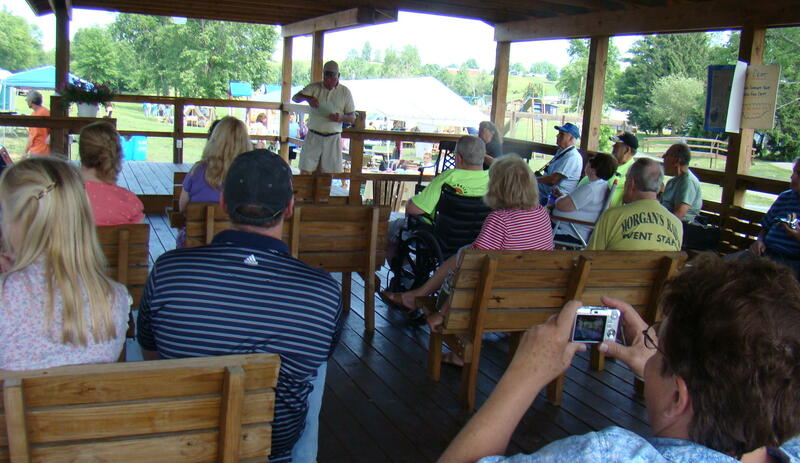 Dave Adair speaks in the pavilion, which was the site of the original train station in Campbell’s Station. Dave also explained why Campbell’s Station changed its name to Lore City. There happened to be two Campbell’s Stations at that time and the larger one kept the name. When deciding what to rename the smaller town, the Irish Catholics had a big hand in it. Their church were attempting to educate the people in this small community; therefore devised the new name as The City of Learning or Lore City… lore meaning knowledge or learning. 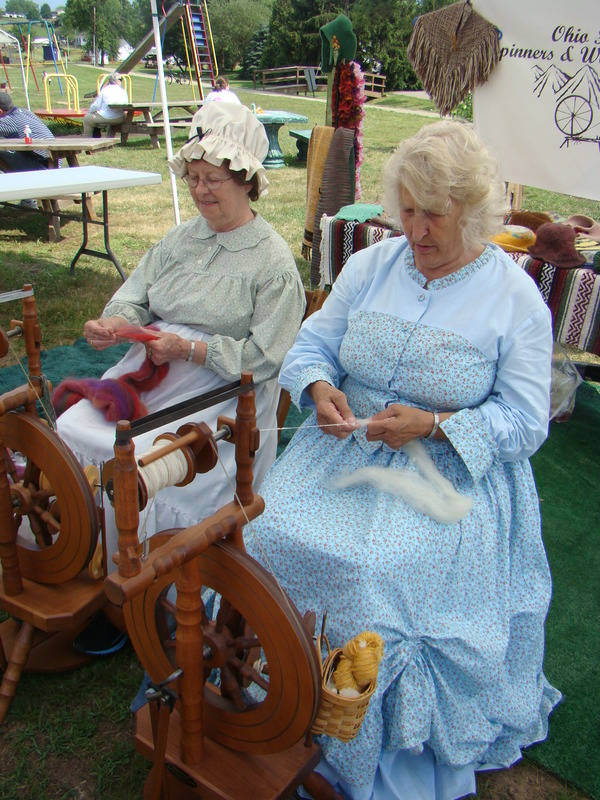 Spinning and weaving demonstrations were given by members of The Ohio Hills Spinners and Weavers, who also added stories of working conditions during the Civil War. Music was plentiful from start to finish. 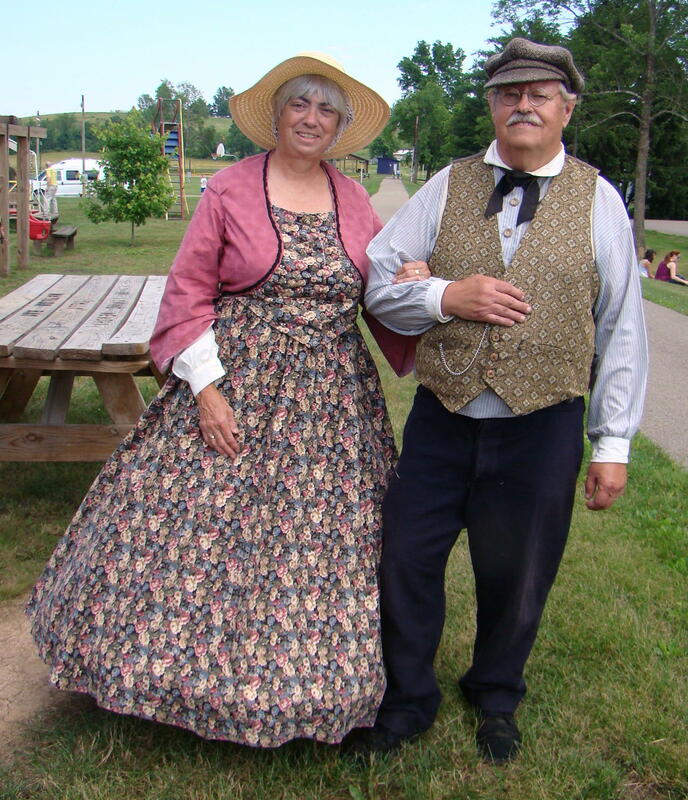 Bluegrass music, which included many Civil War songs, was provided by Mr and Mrs Small. While many of the Civil War songs were of a sad nature, Mrs. Small had written a happy song, Black Berries, to which everyone sang along. Cambridge City Band swung into action with their rendition of Civil War hits such as: Listen to the Mockingbird, Swanee River and many more. This was followed later by Dynamic Trio, who played 50’s and 60’s rock and roll. Horse and wagon riders were greeted by Mayor Carpenter and wife, Sharon. Horses were an important part of the Civil War and it is estimated that over a million horses and mules were lost during the battles. General Morgan was indeed known as “The King of Horse Thieves”. 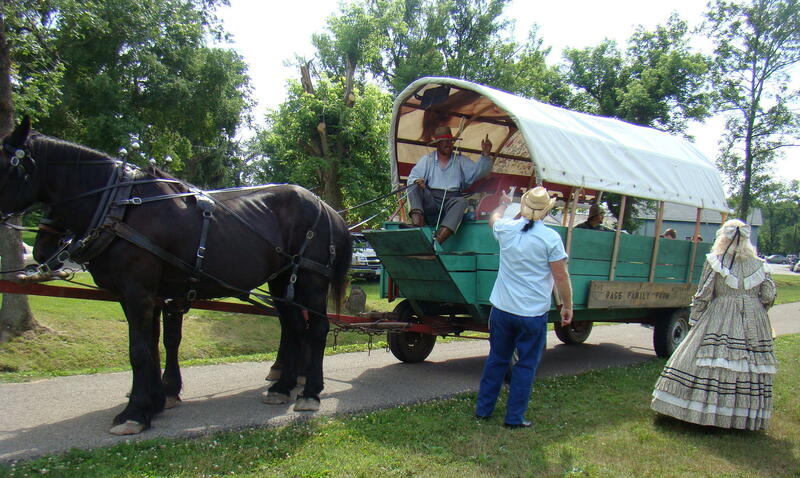 Wagon rides, which seemed fitting for the anniversary celebration, were provided along a segment of the Lore City trailhead in a wagon resembling the wagons used during the war to carry generals, the wounded and supplies. If you want to get a little more adventuresome, today you can follow the trail that Morgan made during his raid. Signs have been posted from Cumberland to Londonderry with information regarding the events that took place in that particular area. Would make an interesting Sunday drive! Lore City, Ohio is located in Guernsey County just east of I-77. Take exit 46, US Route 40 east, then follow Route 40 for four miles and turn right on State Route 265. Continue on 265 until a four way stop, where a right hand turn leads you over the bridge to Lore City. Leatherwood Park is to the left after you cross the bridge.